a Corner To Share: Parcel is put on Hold! Scammer are playing on the dating sites, and social networks, setting up a very nice profiles, and put on beautiful/handsome pictures which are not their own pictures. Usually they will claiming that they are from United States or United Kingdom, but work in foreign country such as Nigeria, Cambodia, Kuala Lumpur, etc. He/she creates a story of a successful business person, has husband/wife who passed away because of car accident, etc, has a son/daughter who lives with his/her mom, or even has no family. They present themselves as a very nice person, caring and loving individual who is searching for their soul mate, partner in life. They are very good at what they do, asking lots of questions regarding what we [the victims] want in our lives. The information they get, then turns it into a dream that becomes a reality to the victim. Scammers use very nice words, romantic and too good to be true. They use psychology to hold us in their spell. Once they have established a nice relationship then the scamming begins. This is the story I wanna share. I met this guy, name James King, at tagged.com site. He started conversation politely, built and impressed a very nice character. Never asked to see my cam. He sent 3 pictures of him which I believe that they were not his pictures. How can I know and being so sure that those pictures were not his? Because he was not able to add more pictures of him when I requested him to send more. Come on! What difficult to send pictures? This is digital era where we can shot our selves every single minutes using our handphone. It is just a single click! Ta Da! But he can't do that. He said that he is not a model type. He doesn't like taking picture. Ok, I changed my strategy. Asked him to show him self on web cam and he did! The relationship was well established. The emotional was bonded well. But of course, I reminded my self that I was doing my research and may not fall and fail! lol. I may not be a victim! But I tried [acting] to flow in his role. He told me that he want to take a break after the project completed. He wanted to visit me and see if there is a possibility to do investment in my country. Oops! My alarm warned me! This is one of scammer's criteria. Doing investment in a victim's country. He also wanted to buy me a house so we can stay together! Oops! This is another criteria. Lol. But I [acting] kept flowing in his role. We chat every day, like a very good couple. One more thing, he proposed me, haha. Until one day, he told me that he has to visit India to collect the money that his company owed him. Come on! This is modern era. Bank era. Transfer era! Why should he fly to India just to collect his money? Why don't just asking the finance to transfer the money into his bank account? I raised this question but he explained that there was some work he should do there beside to collect the money. Ok, acceptable. But then, he also told me that he request the finance to prepare the cash. He doesn't want to have bank transfer system. So stupid! My alarm warned me again. This is a scammer. But wait, flow... flow and flow. You are doing your research! But meanwhile, he was successfully established a very good emotion between us. He was very care for me and my daughter. He shared his daily activity stories, as well as his 'son' [I m not so sure that this son is exist, lol] who is going to college in Miami. Until one day, when he was [pretending?] in 'India, he chat me, told me that he just shopping, bought some souvenirs for me and my daughter. And asking my address to send the parcel. Again, my alarm warned. This is scammer. you should wait and see what is the next step! Surprisingly... the text from his phone shocked me! How can this man being so stupid? Inserted a huge of hard currency in the package of parcel! Oow! I am sad to find the reality, this is really-really scammer. How ever, I do hope that this man will be a good friend of mine, because the way he interacted, the way he communicated, was very nice, was very wise. But day by day, my alarmed warned me more and more! Another text came to me after that, from a courier, name Highfly Courier telling me that the parcel just departed from Indira Gandhi airport, leaving for Bangkok and will continue to Indonesia next morning. This text also shown me the tracking code to allow me checking the status of the parcel. Wow... it looks like real! But wait! It is too good to be true. How can a person that we never known yet, we never met yet, send us gadget that cost a lots? And the more crazy thing was, how can the person who never met us, send us 60,000 US Dollar? lol!!! It is tooooooo good to be true! IMPOSSIBLE. But I am still waiting. There was another text reached me in the evening. From the courier, told me that the parcel just arrived at the airport of Bangkok, waiting to be cleared and will fly to Indonesia tomorrow morning. 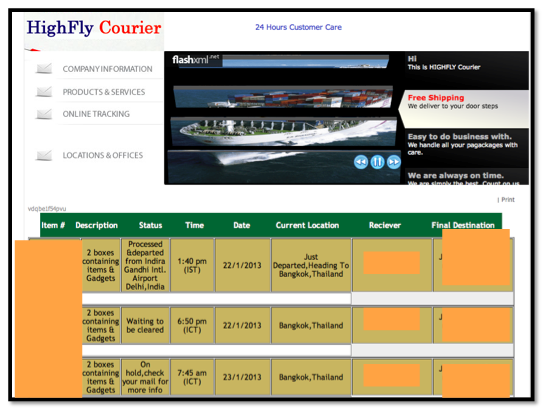 I went to the highfly website to track the status of parcel. Wow, I found the status like this! It was really like real! It made me happy of course, I felt a bit guilty because I have a negative thinking about him. I texted him, let him know the status of the parcel. And he replied, 'hope that you will love the things I send babe!". Wow! Tomorrow morning, the early morning, another text came, and turned this happy feeling back into negative thinking. He is a scammer! Hahaha. What the text said? I went to check my email, and here it is.. 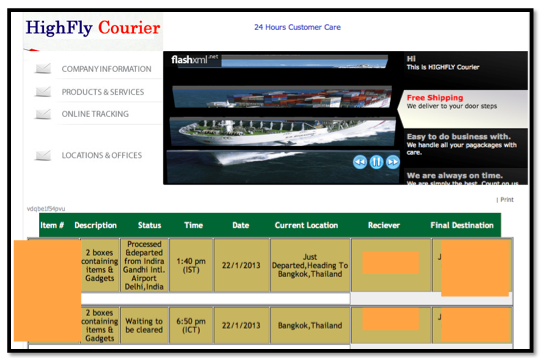 This is to inform you that your parcel is now at Bangkok,Thailand but there was a little problem that was the reason your parcel has not been delivered to you.Despite all our effort with the special securities and agents, hard currency was discovered in your parcel here in Thailand which the custom said to be illegal, but we tried our best to make sure that everything went well. Make sure there is no error on the transfer to avoid any delay or inconveniences and send the details of your payment to us via email for confirmation and your parcel will be delivered to you.For your own benefit,you are advised to make the payment as early as possible today and send us the details of the payment for confirmation and we will work towards the delivery of your parcel.Please remember that your parcel was not opened by customs or individual because it's against the company's policy to open our customer's parcel before delivery,it was only discovered with a scanning machine at the airport but your parcel is safe and will be delivered to your door in some hrs immediately the payment is confirmed.The safety of your parcel is our concern. Speechless! He was scammer! I went to the website and found this updates. I won't do that stupid thing babe! I refused to do that, and told him that I was very busy and has no chance to to that. He got mad but can not force me. Seems he still waiting for my next action and may be hoping that I will go to send the money. But NO WAY! Lol. Then... two weeks later, the parcel was still PUT ON HOLD, haha. He talked to me. Said that he was not happy with me. He has sent the parcel that cost him a lots, and also the currency, 60,000 USD! But see what I did? I did no effort to release the parcel. I believe that he is a scammer.! Well readers, this post have been too long, hope this will give you some input to be more aware of the scammer. They can act in every modus. 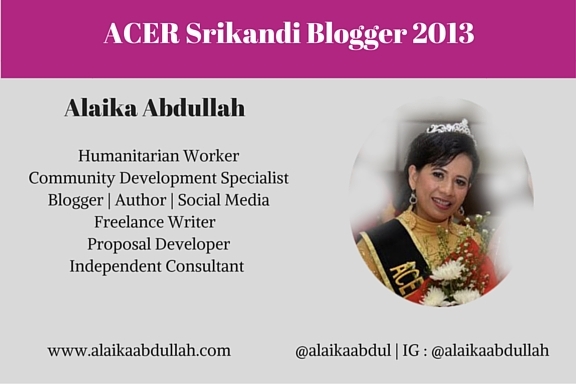 Be aware, for more information regarding scammer, you can access this website and this website . Many times I receive email from strangers who inform me that I got some money from bla bla bla. I never care about such kind of emails.